SH7 6' 10 3/4" 6' 10 3/4" 6' 11" 4' 10" 66" x 25"
Like the larger Grow More greenhouses, Solar Harvest models have a tubular frame which provides greater strength than conventional frames included with most other greenhouse kits on the market. Solar Harvest greenhouses feature a superior tubular aluminum frame, insulated 4mm twinwall polycarbonate panels, sturdy hinged Dutch door, a built-in gutter system, and plenty of roof vents for maximum air circulation. Combine that with the Fast Click system that drastically reduces assembly time all for a price that is hard to beat! Enjoy the light diffusion and beauty that polycarbonate affords without the fear of breakage and drastic temperature changes experienced in glass greenhouses. 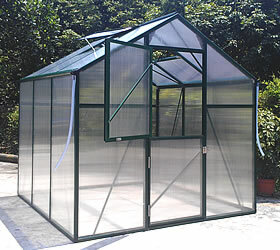 The beautiful powder coated green aluminum frame on the Solar Harvest greenhouses will blend in well in any location. Solar Harvest greenhouses are rated for winds up to 60 mph and snow loads up to 18 lbs. per square foot. Recommended Option: Solar Harvest roof vents can be automated with our Univent automatic openers. They will open and close the roof vents automatically based on temperature and are solar powered. on Solar Harvest greenhouses and extensions purchased with them. 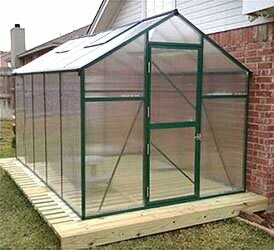 Greenhouses are shipped by UPS and normally delivered in 4 to 8 days. The Univent allows solar-powered control of top and side mounted window vents thanks to its dual springs. Univent window openers have an adjustable opening temperature of 60° F to 75° F and an 18" maximum opening which would be reached at approximately 20° to 30°F above opening temperature. Univents are made from corrosion resistant materials including aluminum and stainless steel. 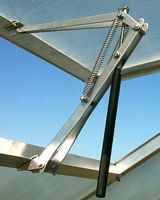 This model is recommended for use with Solar Harvest greenhouse vents because they include a mounting bracket made for them. Order more than one and save! Superior benches for the Solar Harvest greenhouses feature heavy-duty steel frames with a UV protected, baked-on green finish to match the greenhouse. Each bench can support 800 lbs. and comes with multiple adjustable shelves that can be set to any height. Two tier benches are recommended against the side walls. 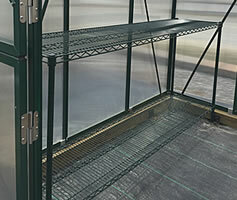 3 tier benches can be placed in the center of the greenhouse or along the end wall. More information about superior benches is available by clicking here.